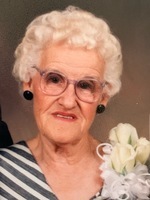 Obituary for Angela "Angie" (Gallegos) Jaramillo | Wheeler Mortuary of Portales, Inc.
Angie Jaramillo, 93, formerly of Portales, New Mexico went to be with our Lord March 18, 2019, in Albuquerque, New Mexico. The funeral service will be held at 2 p.m. Friday, March 22nd, 2019, at Southside Church of Christ in Portales, NM. Burial will follow the funeral at The Portales Cemetery. Angie was born September 3rd, 1925, in Gonzales Ranch, NM. In 1942 she was married to Ernest Jaramillo. The couple was married for 75 years before his death in 2017. She was a Devout Christian and a devoted Minister's wife who so loved the Lord and her family. She was a woman of strong faith, believing in the power and strength of Jesus Christ's love and the beauty and peace that would await her after her passing. Angie is survived by her sister, Chella Archuleta, of Rowe, NM; her sons, Claude (Vickie) Jaramillo, of Portales, NM, Tony (Josie) Jaramillo of Edgewood, NM, Henry Jaramillo of Albuquerque, NM, and Ernie Jaramillo of Portales, NM. Daughters, Pat Parker (Glen), Tina (Jimmy) Gonzales of Portales, NM, Mary-Ann Salazar of Albuquerque NM and Margie (Steve) Clark of Chicago, IL. She is also survived by 13 grandchildren and numerous great-grandchildren. She was preceded in death by her parents, her husband Ernest Jaramillo, a daughter; Nita Fay Jaramillo Colvin, a son-in-law: Tino Salazar, and a grandson; Larry Jaramillo.